CIC™ is offering zero setup fees and a free 30-day trial for a limited time. With 541 units, CICTotal has finally allowed us to efficiently post rent and late fees! Now that we don’t have to go in and manually post charges, our late fee collections have gone through the roof. Contemporary Information Corporation™ (CIC™), the nation’s leading provider of tenant and employment screening since 1986, has released additional information about their cloud-based property management software, CICTotal Manager™. Alongside features like their automated billing capabilities and maintenance request system, users of the U.S. based software have shown reduced delinquencies after utilizing the company’s built-in rent and fee collection tool. Within CICTotal Manager™’s resident portals, tenants are able to submit and see the progress of work orders, view their tenant ledger and pay their rent online. Whether they choose to opt into automatic rental payments or not, the cloud-based software will automatically send a SMS/text and email notification to the resident if they are late on their payment. With automatic rent and fee posting, property managers and staff will have more time to commit to marketing vacancies, managing work orders, and building relationship with renters while eliminating potential billing errors and undercharges. Alongside automatic fee and rent collections, the subscription-based property management software provides additional capabilities like mass resident text messaging, a budgeting feature with an array of reports, marketing analytics and more. The software’s cloud-based platform makes it easy to access property information on the go, and each staff member’s accessibility can be tailored through user permissions. With the company’s award-winning technical support and U.S. based staff, CIC™ promises to boost user’s productivity and efficiency through their all-inclusive property management software. 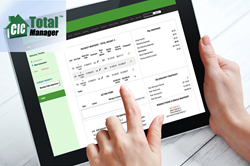 A CICTotal Manager™ subscription is only $1 per unit per month (50 unit minimum) and is integrated with Contemporary Information Corporation’s (CIC™) award winning tenant screening at a discounted rate. The company is also offering a free 30-day trial with zero setup fees for a limited time. Schedule a demo now by visiting http://www.cictotal.com or call 800-288-4757 opt. 2.